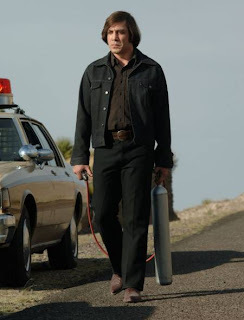 Imagine my surprise, then, when I saw the Coen Brothers' screen adaptation of McCarthy's No Country for Old Men, a relentlessly violent and blood-soaked new movie that holds the proud distinction of featuring one of the most unique murder weapons in cinematic history—a pressurized air hose attached to a small tank that releases a metal rod, typically used to instantly kill cattle—as well as the most simultaneously absurd and scary chase sequences ever—one that involves a killer dog paddling downriver after our movie's hero. Old coots got game. No Country for Old Men, which follows the aftermath of a drug deal gone way wrong, is a gory meditation on fate, chance, and an America in crisis. It doesn't rank among my favorite Coen Brothers movies (The Hudsucker Proxy [I'm serious! ], Fargo, Raising Arizona, Miller's Crossing), but it's an undeniably suspenseful and smart piece of entertainment, even if it's cold and detached. For a shockingly in-depth political analysis of the movie, visit Parabasis. No politics here. I'm still thinking about how I never want to get chased by a killer dog in a river.